West Malling Local Shops Blog: Could Small Business Saturday work in West Malling and the rest of the UK? Could Small Business Saturday work in West Malling and the rest of the UK? 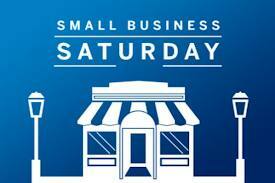 Have you heard of Small Business Saturday? If you know about Black Friday and Cyber Monday then you’re almost there; it’s the Saturday in between the two. Black Friday is traditionally the busiest shopping day of the year in the United States coming immediately after Thanksgiving at the end of November. This has led many large retailers to extend their opening hours and offer fantastic promotions in order to attract shoppers. Cyber Monday is online retail’s chance to shine, and it occurs the Monday after Thanksgiving. Realising that local independent business were struggling to compete on these shopping holidays, the concept of Small Business Saturday was created. It happens on the Saturday after Thanksgiving and it’s a day when shoppers are encouraged to support small local independent businesses rather than using larger national chain. Social media has played a large role in spreading the word about Small Business Saturday, but this has extended beyond that one specific day of the year. The Twitter hashtag #smallbusinesssaturday is now used on any Saturday in the year to promote independent businesses in much the same way as #followfriday is used to promote Twitter users or businesses on a Friday. Could Small Business Saturday Work in the UK? It seems that the idea of launching Small Business Saturday in the UK has been discussed by the government and that American Express has even been asked to consider sponsoring the event in the same way they have in the US. The suggested date for the first Small Business Saturday is 30 November 2013 as this would encourage shoppers to consider visiting and buying from smaller local retailers during one of the busiest shopping weekends of the year. In the UK there are already a number of campaigns underway to boost local retail and reverse the decline in local high streets and independent retailers that we have seen in recent years. The Federation of Small Businesses has a Keep Trade Local campaign which aims to encourage local authorities to spend locally, to improve parking for local shops, and to speed up the planning process for local businesses. Mary Portas’ well-known review of UK High Streets recommended a number of ways we can reinvigorate our local retail areas making them social hubs for the community. We’d love to hear your views on introducing Small Business Saturday to the UK. In the West Malling area we have a superb number of independent shops and businesses. Would Small Business Saturday inspire you to use a local independent retailer, do you already support your local shops and businesses, or do you think there are other ways we can encourage the use of local businesses?